Shop with us today and save considerable cash by buying direct with Memorial Urns and Tributes. 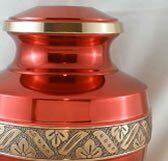 Most of our solid brass cremation urns are sold in funeral homes across the country at much higher prices. In addition, we offer same day shipping and a solid 100% satisfaction guarantee with an easy thirty day money back return policy.